For those of us who believe that God judges a nation from the top down, this entire year has been one of repeated disappointment. We know of God's consistent nature. We've read of His involvement with human kingdoms. We know that He stands behind the thrones of men and we know that nations receive the rulers they deserve. We know this and we fear the future because we know the nation we have become. Recently, the political roller coaster ride pulled conservatives into a devastating corkscrew. It was discovered that the only viable candidate who spoke of preserving conservative values was, himself, caught mocking some of the most sacred areas of human decency. He never was our favorite candidate. We rashly chose him out of blind anger because he brassily spoke the words that we so desperately wanted to say. The Jezebel candidate, the one who enslaves the simple-minded with entitlement policies, was so vile and so anti-God that having a candidate who would challenge her profane mouth with his own profanities seemed so validating. But was it Christian? Do we cross our fingers and hope that Donald Trump will step aside? Do we divide our vote by choosing a third party candidate? Do we just stay home and refuse to participate? Do we bury our head in our hands and just weep? Allow me to suggest another option. May we never forget, the same God who crippled Pharaoh, humiliated Nebuchadnezzar, and caused Belshazzar to publicly wet his pants is the same God who rules over the thrones of men today. If there is one context in which the Father revels, it is the realm of human impossibility. He loves using nothing to bring something, to confound the wise with the simple, to turn certain failure into victory. He revels in the moments when all creation sees Him for what He truly is - the God of the Impossible! What if Christians went to the polls this election day and voted not for the person who is but rather for the person they could become? I beg of you to take time right now and review the stories of two very different world leaders. Notice the way they reacted to God's discipline. First, consider Pharaoh (Exodus 5-14) then give special attention to Nebuchadnezzar (Daniel 4:28-37). Important Questions: Which presidential candidate has shown the most evidence of becoming a Pharaoh (one who stubbornly refuses to take responsibility for mistakes even when they hurt the nation)? Which candidate has shown the most evidence of becoming a Nebuchadnezzar (one who faces humiliation by acknowledging wrong)? The God of the Impossible is not looking for a perfect candidate, He is looking for a candidate who can be molded into His values. Even though many pious religious cowards act like politics is a waste of time, the fact of the matter is this; when great gifts are given, God expects great returns on His investment. We are stewards of a 5-talent level! 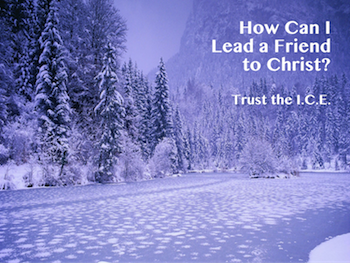 Self-government is a gift from God. Disengaging ourselves from it and the opportunities it presents is like forcing ourselves to ignore the sunrise. For far too long, Christians have been so distracted by the physical side of politics (economy, security, infrastructure) that we have completely neglected the spiritual side (What will best ensure an environment of spiritual growth?). A positive future does not depend upon a President, it depends upon a people - God's people. 2 Chronicles 7:14 (NIV) "...if my people, who are called by my name, will humble themselves and pray and seek my face and turn from their wicked ways, then I will hear from heaven, and I will forgive their sin and will heal their land." This Sunday morning, don't sleep in, don't go to the lake, don't climb a deer stand, don't stay home to watch a football game. Go to the assembly of saints, bow your head, pour your heart out to the Creator. Right now, this very moment, don't rush off to another project, don't push these conclusions to the back of your brain, don't resist the Holy Spirit's calling. Humble yourself! Pray! Seek His face! Turn from your worldly distractions! Pour your heart out to the God Who hears. We have the God-given responsibility to act like 5-talent people. Heaven is listening. He will hear! Will we seek His face? "You do what is right and I will do what is impossible!" - God. 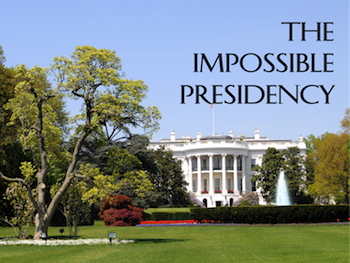 Back to Top of "The Impossible Presidency"